If you’ve suddenly inherited a house, you may not be prepared for the questions and issues that come along with that responsibility. And if you make the wrong decisions, you will likely encounter financial, emotional, and family problems along the way. There is a Latin saying “praemonitus, praemunitus”, which loosely translated also means “forewarned is forearmed”. With this old proverb in mind, here are a few things that can go wrong when you inherit a house in California. 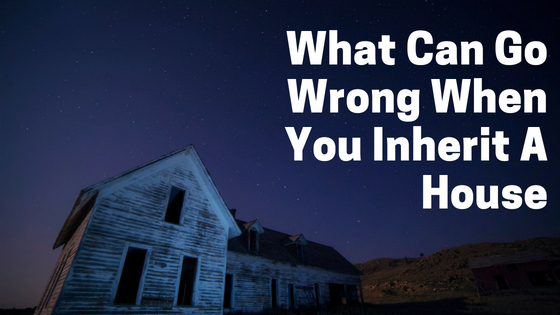 What Can Go Wrong When You Inherit a House in California? Most people don’t have to worry about the estate tax because the very high exemption is in the millions, and the estate tax was even temporarily suspended in 2010. But also predominantly suspended in 2010 was the step-up provision. So, as you consider what can go wrong when you inherit a house in California and when you intend to sell it, you need to consider how stepped-up capital gains figures into your financial projections. The step-up provides that you pay capital gains taxes only on the gains above the fair market value at the date of the decedent’s death. It has nothing to with the price the decedent paid for the house – unless the step-up falls in one of the years when it was changed. In that case, you may owe a lot more in taxes than you had originally thought. In the past, when an older parent or relative passed, the mortgage on their house was paid off. These days, though, it’s common for older people to take out a reverse mortgage on their home to supplement insufficient retirement funds. This is happening more and more, especially because people are living longer than expected. You need to be aware, then, that a reverse mortgage cannot be assumed by the heirs to the estate. And in the case of a regular mortgage, you can assume the mortgage only if you live in the house yourself. So if you intend to rent the house, you may have to refinance it into your own name, so plan accordingly. With respect to what can go wrong when you inherit a house in California, this one may be the most costly. Most of the time, people inherit a house from a deceased elderly parent or from a very close relative. Besides not having the physical ability to perform maintenance and upgrades, many elderly people don’t have the money for all the necessary repairs either. Some just don’t think they are worth doing at all. And if they do, they may simply choose not to because they know they won’t be living in the house very many more years. If you plan to live in the inherited house, this may not be a huge concern. But if you intend to rent it or sell it, you’ll have to make repairs to make it presentable and upgrades to bring it up to code and meet many other legal and insurance requirements. Installing a new HVAC system or re-wiring the house will involve spending a large amount of money. But what if you’re not the only heir? That can be a major problem. Suppose you and your siblings inherited the house jointly. Maybe you want to sell the house, but your brother wants to rent it out, and your sister wants to live in it with her family. You can see what a disaster this can become, quickly. In most states, joint heirs of an inherited house are considered tenants in common, and one heir can force a sale if it comes down to that. The process, however, is expensive, and the emotional and familial consequences are likely to be very difficult. So what can go wrong when you inherit a house in California? Quite a lot, actually, if you’re not well-versed on tax laws, mortgages, and upgrade issues. It is best to contact a qualified professional, such as a trust attorney to help head off these issues quickly and properly. We’re ready to help you reach your real estate goals and will be glad to answer any and all questions. Contact us by phone at (424) 242-9304 or fill out the online form.